Given the desperate need to find common ground between the Christian and Islamicate worlds it is surprising that more attention has not been paid to the influence of Persian literature on 19th century Romanticism, an influence which left its mark on many of the great minds of the West. The bridge between the two cultures was built by the German poet, translator, and professor of Oriental languages Friedrich Rückert (1788-1866) who translated into German the poetry of Rumi (who he described as "a great Sufi"), Sa'di, Jami and Hāfez. It was Goethe's admiration for the gazals (lyric poems) of Hāfez in translation that inspired his West-östlicher Divan (West-Eastern Divan) which was published in 1819 and from which Daniel Barenboim's band takes its name. Little is known about Hāfez. He lived all his life (1320-1389, which is contemporaneous with Chaucer) in the Persian city of Shiraz. He was a Sufi master, philosopher, mystic of Islam and spiritual rebel who wrote more than 5000 poems. Only around 700 of these survive, the rest were destroyed by clerics because of their ecstatic and heretical content encouraging union with the Divine - an action which presaed the persecution of Sufis by today's Muslim fundamentalists. Goethe wrote his West-östlicher Divan both as a tribute to Hāfez - who Goethe referred to as his "spiritual leader" - and as a humanitarian treatise that transcends cultures and centuries. Among the composers who set poetry from the West-östlicher Divan were Franz Schubert, Robert Schumann, Felix Mendelssohn-Bartholdy, Hugo Wolf, Richard Strauss and Arnold Schoenberg. The influence of Hāfez's gazals spread beyond Goethe to Victor Hugo and to the pioneer American transcendentalist Ralph Waldo Emerson, who acknowledged him as “a poet for poets”. Goethe's West-östlicher Divan was also one of the routes that led Nietzsche to Persian culture, a route that led on to Thus Spoke Zarathustra and further onwards to Wagner, Hitler and, surprisingly, to Delius. Goethe's admiration and debt to Hāfez influenced his worldview as well as his poetry. It is often overlooked that Goethe opined that there is "much nonsense in the doctrines of the [Christian] church." (Conversations with Eckermann and Soret, 1832). In his Divan Goethe stresses the benefit of the Sufi teaching of valuing the precious present moment against the Christian attitude of waiting for the next life and therefore, devaluing what God gives humankind in every moment of life. He also denounced sectarianism, saying "If Islam means submission to God, we all live and die in Islam". Goethe read the Qur'an in German translation and his ecstatic poem Mahomets Gesang (The Song of Mohammed) was set in an uncompleted work by Schubert. Much more recently a 2013 project supported by the Goethe Institut à Paris and Festival d'Ile de France brought together in a new music commission which is available in a CD/DVD release the poetry of Hafez and Goethe . The Divān project was the brainchild of the Syrian-born French-resident composer and musician Abed Azrié; Azrié's 1991 Nonesuch album Aromates is acknowledged by John Adams as an influence on Act 1 of The Death of Klinghoffer, and his syncretic Arabic setting of the Gospel of John featured here in 2010. 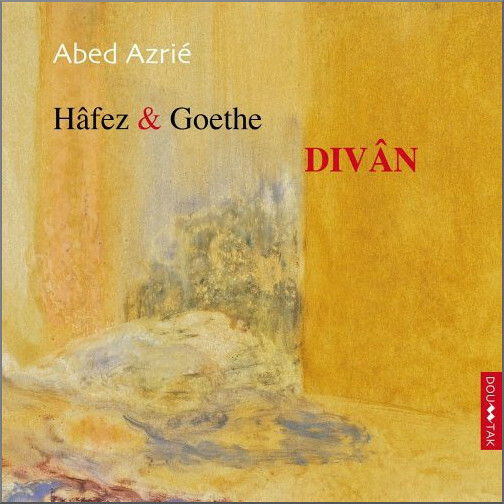 Divān juxtaposes the poetry of Goethe and Hafez, sung in German by tenor Jan Kobow and Arabic by Abed Azrié respectively. The music by Abed Azrié, which is scored imaginatively for bandoneón, violin, string bass and piano, continues the theme of influence, with the German settings indebted to Schubert and Weill, and the Arabic to Azrié's native Syria - see music samples below. The recent barbaric attack at Westminster can only be condemned in the strongest possible terms. But the mawkish and unhelpful outpourings of both the mainstream and social media that followed must also be condemned for different reasons. Much reflective silence leavened by sparing exposure to the mystical power of the axis of eloquence that unites East and West is the only balm that will heal the present wounds. With thanks to Yahya Lequeux of the Naqshbandi Sufi Order. No review samples used. Any copyrighted material is included as "fair use" for critical analysis only, and will be removed at the request of copyright owner(s). Also on Facebook and Twitter. So very fitting that the 'Hafiz Goethe' Memorial is in Weimar, which is'twinned' with Shiraz, and on Beethovenplatz, locations that resound.